The lithium rubidium molybdate compound LiRbMoO4 was prepared by the solid-state reaction method. XRD spectra revealed a single phase material with an orthorhombic structure. The internal Raman modes were observed at room temperature. The dielectric measurement exhibited three subsequent phase transitions: two structural transitions at the neighborhood of 397 K and 420 K followed by a ferro-paraelectric transition at 424 K. The Nyquist plot was proved to be a non-Debye relaxation mechanism. The combined spectroscopic plots of the imaginary part of electric impedance and modulus in the temperature range of 581–718 K at various frequencies confirmed the non-Debye behavior. 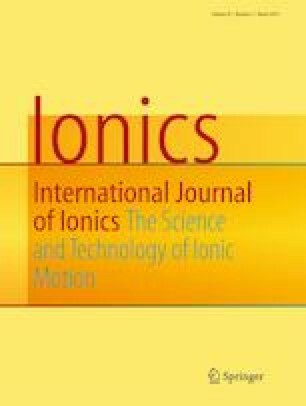 The AC conductivity was found to follow the Jonscher’s universal dynamic law ωS, and the overlapping large polaron tunneling model (OLPT) was proposed to describe the conduction mechanism.